Meet John Morrissey, the Irish immigrant who stood up to Bill the Butcher, became a bear-knuckle boxing champion, took down Boss Tweed, founded the Saratoga Springs racetrack and served in the United States Congress. His story, told partially through our own records, is a tour de force through 19th century American life. He participated in a world very familiar to our Irish ancestors. Not only is his story interesting, but it shows us much about the world our ancestors lived in. Morrissey's story is a great tale of the upward mobility possible in American society at this time, but it also shows us that there were certain prejudices even the most successful of our ancestors could not overcome. In 1833, his family immigrated to America and eventually settled in Troy, New York. He worked in a local mill from a young age, and eventually became an iron worker - he was well built and had a reputation for handling high volumes of strenuous physical activity. It seems that Morrissey frequently found himself in trouble in Troy. As a young man, he roamed the streets with local gangs and earned a reputation as a brawler and eventually wound up working as a bouncer for local brothels. He was arrested several times for burglary and assault - once with the intent to kill. Despite his penchant for less-than-legal activities, he was a hard worker - he taught himself to read and write as a teenager, and courted Susie Smith, the daughter of a local steamboat captain. But he could not escape the law or clean up his act enough to win the heart of Susie. After spending two months in jail, he left Troy for New York City. Morrissey brought his rough and tumble attitude to the big city and received a rude awakening. Upon arriving, he walked into the Empire Club, a well known establishment associated with Tammany Hall, the infamous political machine. He proudly declared he could win a fight with any man present. In response, he was given a sound beating by the crowd. But owner of the establishment Isaiah Rynders (a prominent Tammany Hall leader) took note of his stature and fearlessness. He offered him a job as an emigrant runner. As an emigrant runner, Morrissey welcomed Irish immigrants at the docks and helped them get naturalized and find homes and jobs. In exchange, they became part of the political base that would support Tammany Hall-backed politicians. After a few years of working for Tammany Hall, Morrissey stowed away on a ship bound for California to participate in the gold rush. He was actually caught by the captain, but his size and fighting ability saved him again - he protected the captain and crew from a brewing ship mutiny in exchange for free passage. He didn't find any luck mining for gold in California, but he began a very successful gambling business and profited immensely from the wild financial habits of the forty-niners. He also began fighting in professional bare-knuckle boxing matches - a sport that was officially illegal but existed with great popularity in the many areas of America that were beyond the arm of the law. 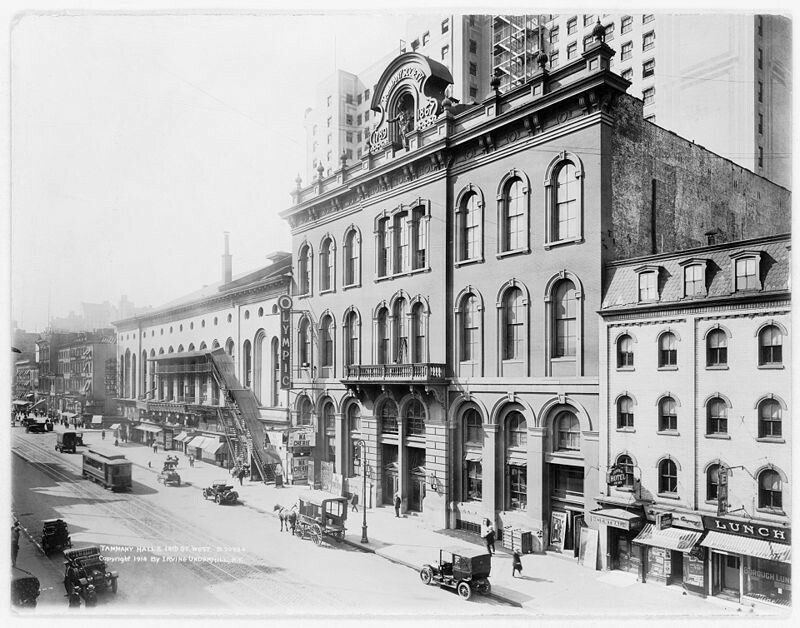 Between fighting and running gambling operations, Morrissey made himself a small fortune before returning to New York and getting more involved with Tammany Hall. Morrissey returned to New York and continued prize fighting and in 1853, he successfully challenged the famous boxing champion Yankee Sullivan. The match took place far from the city, in a rural Boston field with a crowd of 3,000. In the crowd was William Poole, commonly known as Bill the Butcher - a deceitful and bloodthirsty nativist who led the Bowery Boys gang and acted as an enforcer for the anti-immigrant Know Nothing political movement. William, a boxer himself, lost big by betting against Morrissey that day - the beginning of a feud that would make the two mortal enemies. In 1854, Morrissey and his associates were hired by Tammany Hall as shoulder-hitters - brawlers who could defend the ballot boxes from being tampered with. Tammany Hall was trying to save their mayoral candidate Fernando Wood, from electoral meddling. Bill the Butcher and his Bowery Boys vehemently opposed Wood and mounted violent assaults on Morrissey, trying to manipulate results from the ballot boxes they defended. Morrissey and his gang successfully defended the boxes, resulting in a victory for Wood and lots of favors from Tammany Hall. With Tammany's power keeping the police at bay, Morrissey began to open more gambling establishments and reap huge profits. But Bill the Butcher had not forgotten about his multiple embarrassments at the hands of Morrissey and continued to harass him and his Irish-American compatriots. Morrissey and Poole eventually squared off in a boxing match that led to a disputed result, raising tensions between the two and their gangs even further. 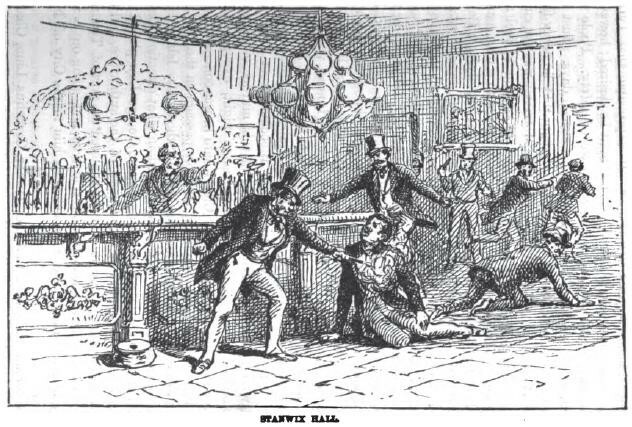 This led to a series of violent street clashed, and finally on February 2nd, 1855, Morrissey and his friends got into a fatal tussle with Poole at a pub. Morrissey's Welsh-American friend Lew Baker shot Poole in the leg during the altercation, and Bill the Butcher would die from the wound just over a month later. We were able to locate numerous newspaper stories outlining the incident, investigation and trial in our U.S. Newspaper archive (including the headline above). 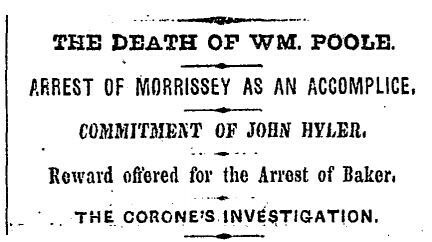 Morrissey was initially charged as an accomplice, but was never convicted. Baker evaded the law, was eventually captured, but was never convicted thanks to several hung juries. Bill the Butcher's killing, violence and discrimination against the city's Irish-Americans had finally come to an end. New York City was a very divided and contentious place at that time, with many anti-immigrant nativists who were fans of Poole - less than a decade later, this powder keg would explode into historic violence during the New York City Draft Riots. Although 20,000 people allegedly attended Poole's funeral, New York City refused to lower their flags to half staff to honor such a man. After these events, Morrissey went back to upstate New York to join his teenage love Susie Smith who - we discovered in our U.S. marriage records - he had married the previous year. He participated in one final boxing match to defend his title from an old rival named John Heenan. He successfully defended his championship belt and then permanently retired. Morrissey then invested his time, energy and money into growing his gambling enterprises, which he did very well. He amassed a small fortune and befriended Cornelius Vanderbilt, who helped him lucratively navigate the stock market. He eventually set his sights on the city of Saratoga Springs, already a popular vacation destination for New York City's elites. He built a casino right by the train station and soon created the Saratoga Race Course, which is now known as the oldest sporting venue in the United States. 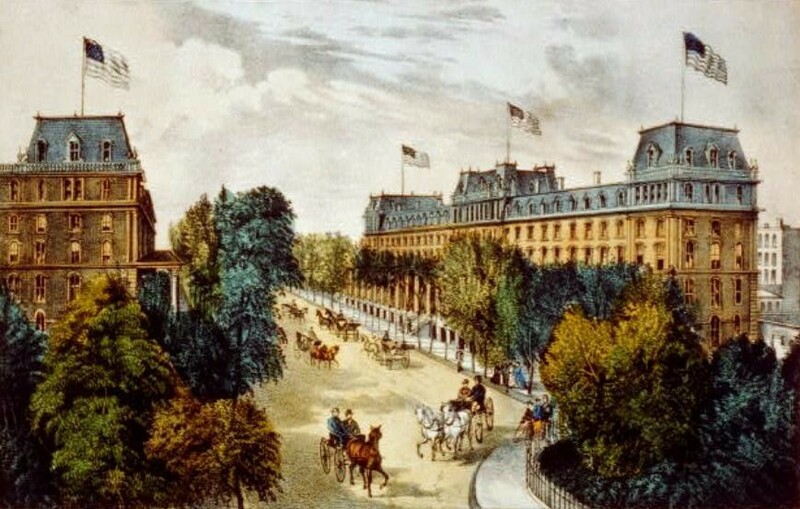 Saratoga became a premiere 19th century destination, seeing visitors such as Cornelius Vanderbilt, John D. Rockefeller, Mark Twain and future Presidents Chester A. Arthur, Rutherford B. Hayes and Ulyssess S. Grant. Unfortunately for Morrissey, although he was well-liked and by this point very wealthy, he was never fully accepted into the upper ranks of American society. There was still a great anti-Irish sentiment among many, and his status as an immigrant prevented him from an elite. With the backing of his old friends at Tammany Hall, Morrissey successful ran for Congress and served two terms in the U.S. House of Representatives. He was known as a champion of Irish-American interests while he served in the Federal Government, never forgetting his roots. It also appears he never quite lost his pugnacious attitude - he is known for attempting to achieve his legislative goals through threats and intimidation, one time allegedly boasting that he could "lick any man in the House." Morrissey eventually turned on his backers from Tammany Hall, possibly growing tired of the rampant corruption of William "Boss" Tweed. He attempted an internal coup to takeover Tammany Hall, and played a key role in testifying against Tweed once his endless corruption finally broke out into scandal. 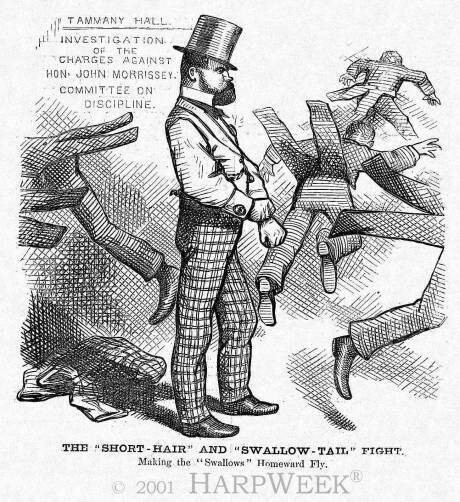 With Tweed in jail, Morrissey continued to play the treacherous game of Tammany Hall politics and was eventually ousted. He went on to form a rival political organization, Irving Hall, and even served as a New York State Senator in 1875. His political career was cut short by a fatal case of pneumonia in 1878. Our Irish immigrant ancestors may not have lived as wildly as John Morrissey, but their own experiences in this world are no less enthralling.